Would you visit a city just to eat at one restaurant? Maybe you should, especially if its culinary offerings reflect the city’s cultural essence as well as Otoño. 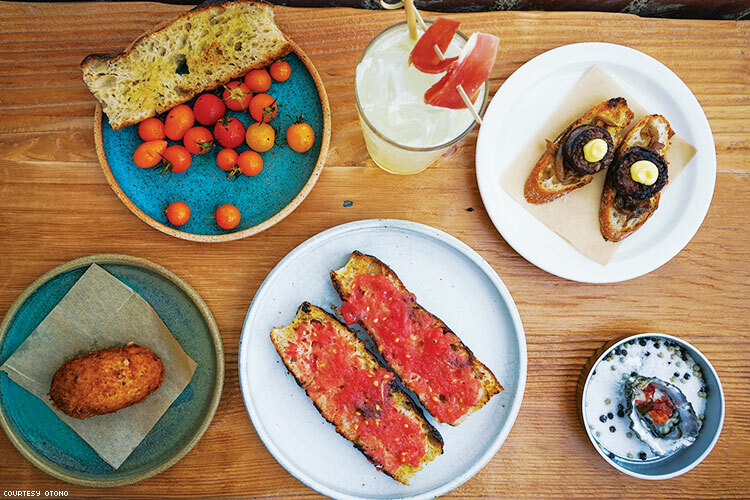 The Los Angeles restaurant beautifully nails L.A.’s melting pot vibe, infusing Spanish cuisine with Mexican and Asian flavors and California’s focus on fresh, local, sustainable ingredients — all while embracing a small plate and street-food spirit. It’s hard to believe that Otoño, which is widely hailed as L.A.’s hottest Spanish restaurant, is also one of the city’s newest, having just opened in late 2018. It’s also hard to believe that lesbian chef and owner Teresa Montaño wasn’t always destined for the kitchen. Instead she imagined her future on a soccer field. The New Mexico native was a soccer prodigy who began playing at 4 and was later recruited to play at Pepperdine University. Melting Pot:Teresa Montaño (above), chef and owner of L.A.’s Otoño restaurant, blends Spanish cuisine with Asian and California influences for her delectable tapas plates (below). 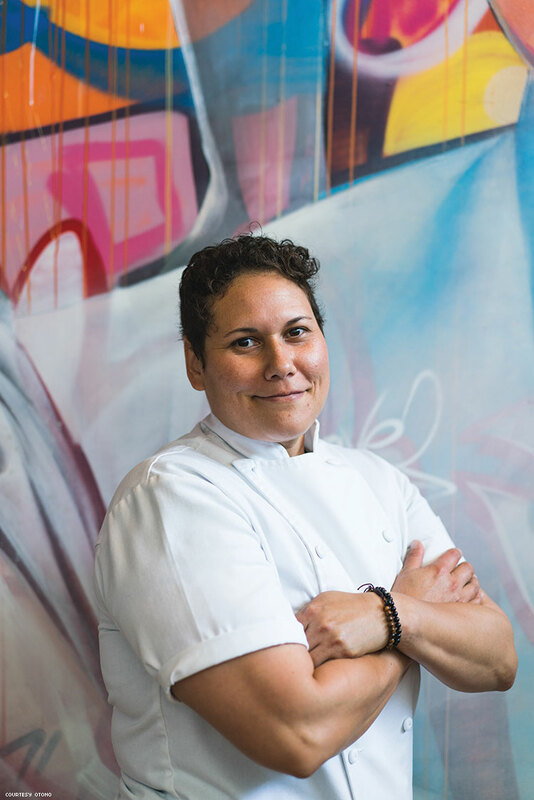 Montaño attended culinary school, worked at a Tender Greens, and eventually opened her own restaurant, Ración, which served Basque tapas and won raves in Pasadena for six years before succumbing to the recession. But before launching Otoño, her latest endeavor, Montaño embarked on a two-month culinary adventure that took her through Spain, Italy, and Denmark. In Copenhagen, she worked at a restaurant she credits with exposing her to innovative vegetable-centric dishes and new methods for minimizing food waste. That was one reason Montaño also decided to incorporate a bar into Otoño’s design. Visible from the street, it helps draw people into the restaurant. She wanted to create “a busy bar that’s always just bringing life to the rest of the restaurant.” It’s working. During the bar’s “siesta hour,” tapas are as inexpensive as $3, and Montaño has the freedom to get creative. For this chef, that often means embracing the constraints of simplicity — like charcoal-grilled cherry tomatoes seasoned with nothing more than Otoño’s in-house prawn-and-tomato salt. 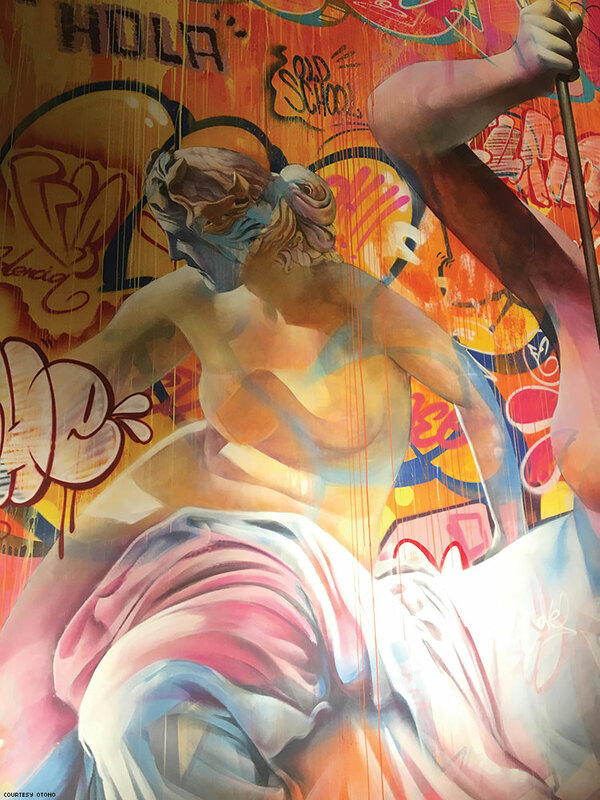 The mural, which draws customers further into the restaurant, is also a perfect metaphor for what Montaño does with Spanish flavors. Being inspired by the classics, but not pinned in, the chef brings something new and modern to traditional Spanish cuisine. There’s a melting pot kind of international influence to her interpretations. You’ll find Japanese dashi in the paella, miso mixed in with the vegetable stock. As Montaño alludes, for all its international flavorings, there’s no mistaking that this is a Southern California restaurant. Inspired by the area’s focus on fresh, locally (and sustainably) harvested ingredients, Otoño’s menu changes frequently to take advantage of farmer’s market finds and reflect the changing seasonal availability. The unique mural (above) perfectly complements the street food. As Montaño suggests, inventive drinks follow her philosophy, and bar director Gavin Koehn reimagines Spanish mainstays. Otoño’s in-house Tinto de Verano, a drink typically blending Sprite and rosé wine, mixes rosé, Spanish rum, and Pellegrino lemon. 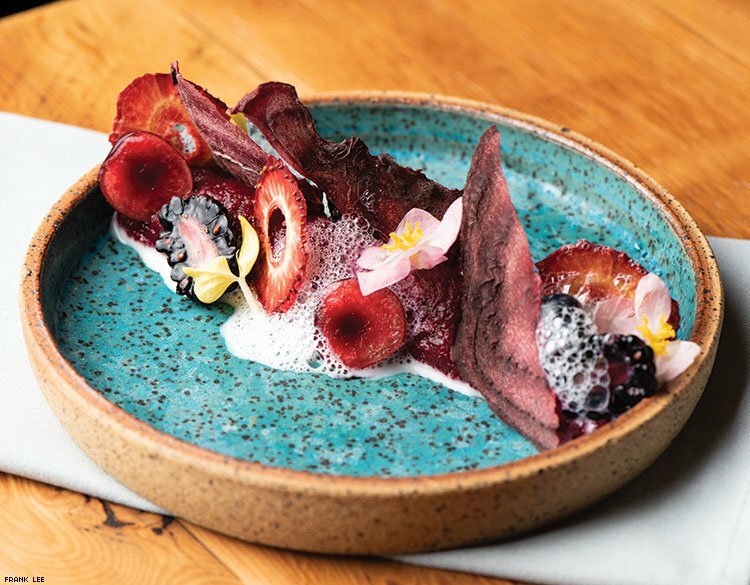 Small plates make up much of Otoño’s menu, but you mustn’t miss the delicious seafood paella or the delectable (and breathtakingly gorgeous) beet morcilla with almond horchata, strawberry gel, and beet meringue for dessert. Still, start with the tapas, particularly the fried croquetas (filled with jamón serrano and cow’s milk or sweet corn and mushroom with goat’s milk) and the Pan con Tomate.